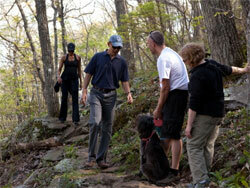 If you’re planning a summer vacation, you could do worse than following in the footsteps of an American President. Vacations are front and center these days with the summer travel season just around the corner and news of President and First Lady Obama’s weekend getaway to Asheville in the Blue Ridge Mountains. To view the multimedia assets associated with the release, please click here. "The president first visited the Asheville area during the campaign, and he liked it so much that he vowed to take his family there. The president and first lady are planning to spend a quiet weekend enjoying some of the many things this beautiful part of the country has to offer," said White House spokeswomen Moira Mack.